Email marketing is an excellent way to connect with your customers without having to spend a whole lot of money. Here are 5 email marketing tips your business should implement. Make subscribing easy – Create a form for sign up on your home page, Facebook page, blog, and wherever else potential customers are already found. Collect names and email addresses. You could collect birthdays to provide a free gift, invite visitors to join groups, etc. Just don’t include too many fields because if it takes too long to subscribe you’ll scare visitors off. Let your subscribers know what they can expect from you – What will you be sending? Newsletters, daily deals, weekly tips, company updates, etc. Give them all the information you can on your sign up sheet, and even let them choose what they’d like to receive. Send out an email to welcome your subscribers – Sending out a welcome email makes the client feel good, and it reminds them why they are on the list. You can let them know that there’s good things to come and even give new subscribers a special offer. Make sure your newsletter fits your brand – When creating your email campaign you need to make sure that you match the look and feel of your brand. If you are taking advantage of a template to create your newsletter, then you need to customize it with your company colors and include your logo. Creating consistency creates familiarity. Send subscribers the type of content that you want – For example, if you are offering a newsletter then make sure that the content that is in the newsletter is relevant to your market. If you have different email campaigns for different groups then you need to make sure that each group is getting content that is relevant to them. There’s no faster way to lose subscribers than by not offering them something they are interested in. In addition, it needs to remain fresh and current. 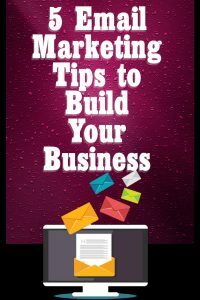 Email marketing remains one of the leading ways to grow your customer base. You first bring visitors on board because you offer them something they are interested in and then you can sell them something. What makes email marketing so powerful is that you can continue to sell them different items that are relevant over and over. Building your customer database through email marketing is building yourself a repeating income as long as you don’t make these email marketing mistakes.